Choosing the right bunk bed for your child might be a little more complicated than buying other furniture for your home. When selecting a bunk bed, there are more safety concerns, and you want to please your child in addition to being happy yourself. As in any furniture purchase, you should start out by determining your needs. Bunk beds are a natural fit for smaller spaces but can have plenty of benefits for larger rooms, too. Start by measuring your space. Along with floor space, determine ceiling height, too. Leave at least two feet of space between the bunk bed and the ceiling to prevent bumps. While bunk bed heights vary, the average bunk is usually between 5 ½ and 6 feet tall. As for floor space, keep in mind that while a twin bunk bed might not need more than a standard twin bed, some of its special features, such as pull-outs like drawers or trundle beds, will require more room, as might an L-shaped bunk bed. There are many types of bunk beds ranging from the basic twin-over-twin to elaborate combinations that cater to different needs. Depending on what you may need, most bunk beds fall into two broad categories, basic and lofted, with many subcategories under each one. For instance, basic bunk beds are available as twin-over-twin, twin-over-full, etc., while lofted beds could come with a lofted bed over a futon or a lofted bed over a study center. There are also configurations that offer triple sleeping surfaces. These can be handy for sleepovers or when three children share a room. Special features, such as study areas, storage, or play features such as slides or tents are available, depending on the age and needs of your child. For children who like to have friends sleep over, bunk beds with futons or pull out beds are good options. You can pick out bunk beds that come with the features you desire or buy them as add-ons. It is always worth it to get your child's opinion and consult him about his needs, as you might be overlooking something. Since bunk beds come in an array of styles, you have plenty to choose from. You also have a choice of materials that you can select, such as all wood, all metal, or a combination of the two. You can also find bunk beds in all different styles. You can select from traditional styles in darker woods with detailing, or go with a style that is more modern with sleek lines. Should you prefer a cottage or country style, you have plenty of options. If your child prefers a themed or novelty look, you can still find plenty to choose from. Bunk bed safety is important. 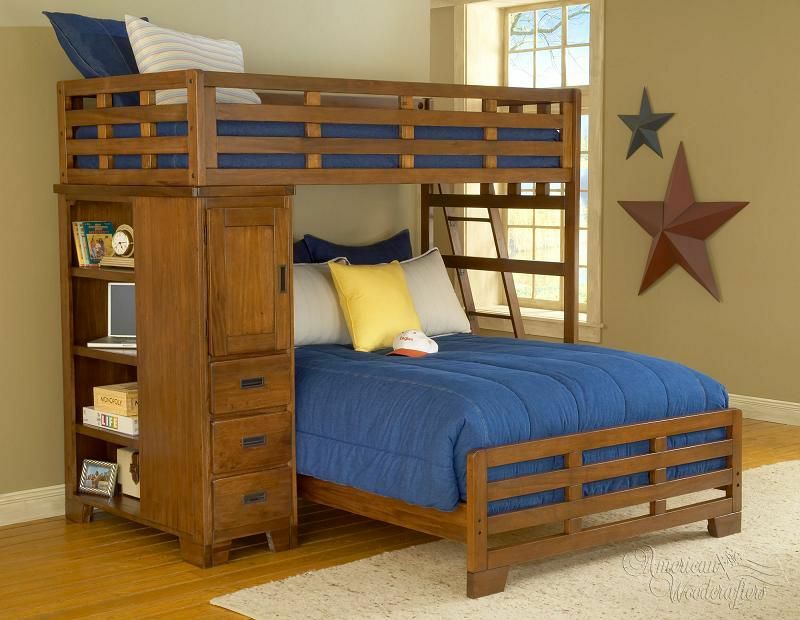 Make sure that your bunk bed has all the safety features such as guardrails and headboards and footboards. It is also important to explain to your child that it is essential to observe all safety rules when using a bunk bed.